Whenever I cook ham, I always seem to have leftovers, and as much as I love ham sandwiches, I can only eat so many of them. I often make a ham and scalloped potato casserole too. But that, too, gets old. I came across this recipe from Kraft and it seems not only quick and easy for those days when deadlines loom, but both warm and gooey enough for a chilly day or light enough for a warm one. Haven’t made this one yet but I will be soon! Happy eating. 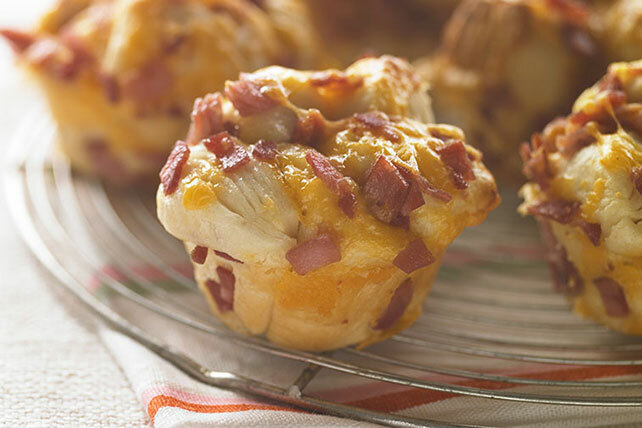 Warm, buttery-tasting biscuits with savory smoked ham and melty Cheddar. That’s all you need to know for a crowd-pleasing addition to brunch. •	Combine ham and cheese in large bowl. •	Cut each biscuit into 4 pieces. Add to ham mixture; mix lightly. Spoon into 8 muffin pan cups sprayed with cooking spray. •	Bake 20 min. or until puffed and golden brown. Cool 10 min. before removing from pan. Serve warm. This entry was posted in Writing Life and tagged family, food, fun stuff, recipe, Tuesday Treats. Bookmark the permalink. Ooo, diced roasted chicken and cheese would be awesome, too.